If you are using Google's Chrome web browser you may notice that it labels this website as 'Not Secure' - that's simply not true. 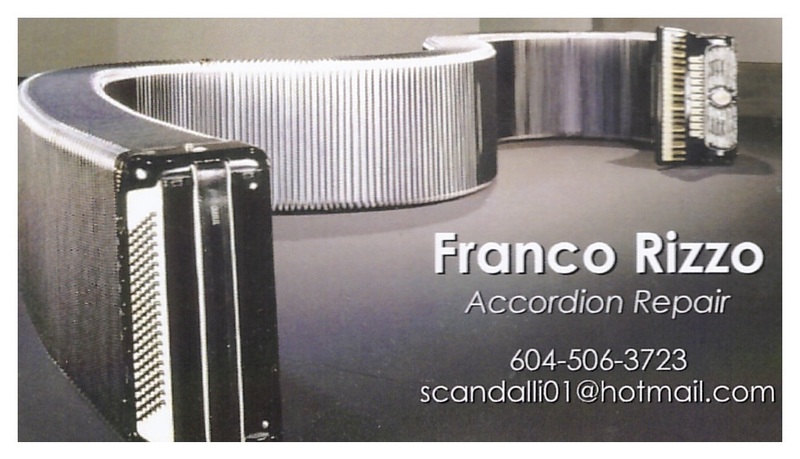 For more info, see: "Google and Http"
It's "an informal gathering of accordions and their players from around the Vancouver region. Some play, some watch. No experience necessary, punk-rockers and polkas welcome." 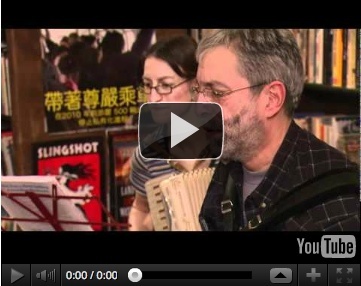 Set up a lesson, learn a lick, share a song, plan the squeezebox revolution (it is at Spartacus Books after all.) Check out the link for homework: tunes we played at past sessions or hope to play at upcoming ones. 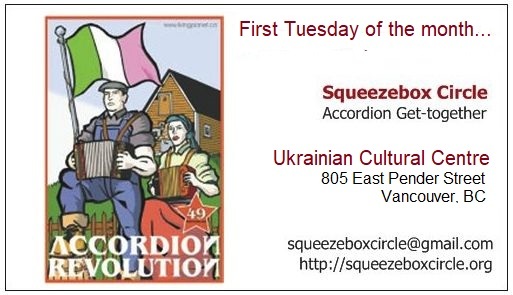 Stay in touch by joining the Squeezebox Circle email list and our Facebook group. Watch a video short on the Circle made by TelusTV in February 2011 and check out the Facebook Vancouver Squeezebox Circle group. Contact: To add your event, band, or other resource to this website - or for more information, email us! 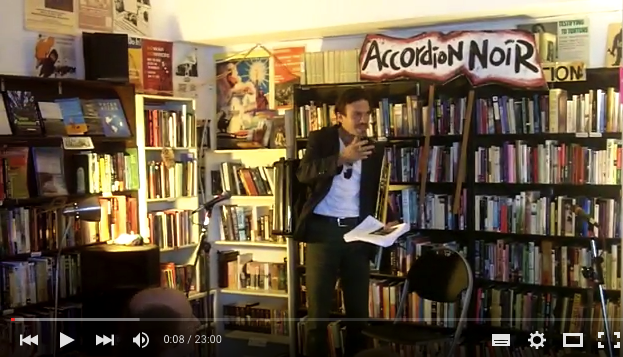 Jack Garton - Accordion Balancing at the 2015 Accordion Noir Festival. 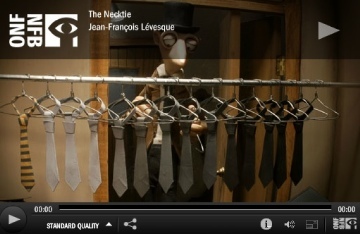 Bonus: National Film Board of Canada animation - The Necktie (http://www.nfb.ca/film/necktie/) - watch it online! Petosa Accordions- in nearby Seattle, WA. Tempo Trend Music in Victoria specializes in accordions and accordion repairs. Ben Alija: email - ylber_alija@yahoo.com, tel - 604-726-9710. Accordion Cafe is a growing online resource with lessons, sheet music, how to improvise info and more. Free registration required. Print your own Accordion Revolution stickers onto label paper! Accordeon accordion simulator with versions for iPhone, Ipad, or iPod Touch - search iTunes App Store for other accordion-learning apps for piano accordion, chromatic button accordion, and button box - such as the Piano Accordion Pro for iPad - watch this YouTube clip to see it in action! Accordionwise - nice sets of tips and tricks to bring your playing up a notch. 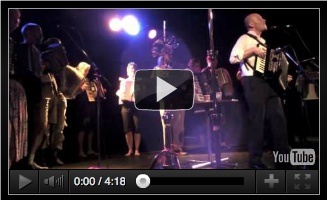 (Chromatic) Button Accordion vs Piano Accordion - which is right for you? Accordion Gallery - sales and repairs for the NYC area (located in New Jersey). NY Times article. Boxes Without Borders offers a growing set of sheet music for traditional tunes from many cultures, with recordings of each. Gabbanelli Accordions - premium handmade accordions, made in family-run shop in Houston, Texas, and shipped world-wide. Here's a Houston Chronicle article about them. Petosa Accordions- in nearby Seattle, WA. Read this newspaper article about their history. 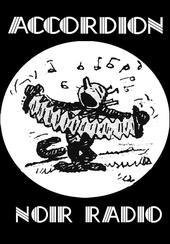 Accordions Worldwide: Weekly accordion news from around the world about accordions and other related bellows driven instruments. Accordionist.org: The Online Accordionist Community is a great place to meet other accordionists, accordion teachers, and repairers. Share practice techniques and repair tips; news of concerts, recordings and competitions; music files and sheet music for accordion. Hohner Squeezebox App - mimics the company's Corona diatonic models - a variety of 2 row and 3 row accordions in different keys, for iPad, iPhone, iPod Touch - even virtual pulls and pushes. Museo della Fisarmonica - Castelfigardo, Italy - website in Italian. Great historic photos. MuseScore - free music composition and notation software for Mac, Windows & Linux. And a get-started tutorial. Music Prevents Delinquency - you better believe it! From a 1959 book of accordion lessons for beginners. Squeeze This! A Cultural History of the Accordion in America - by Marion Jacobson. Newly published book considers the accordion's contradictory status as both an "outsider" instrument and as a major force in popular music in the twentieth century.